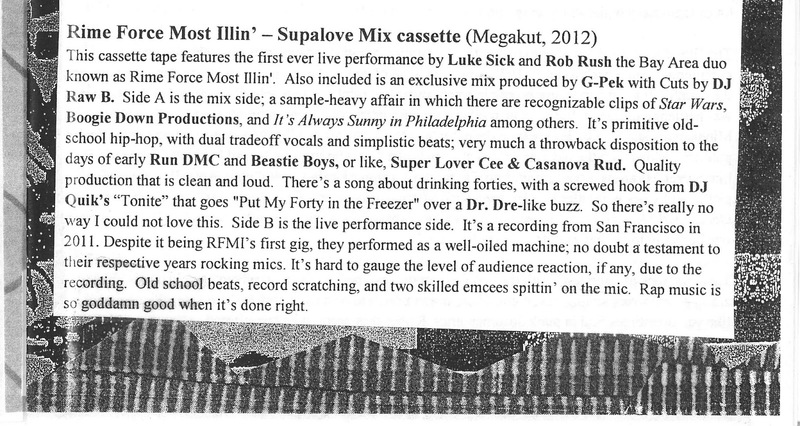 This cassette tape features the first ever live performance by Luke Sick and Rob Rush, the Bay Area duo known as Rime Force Most Illin'. Also included is an exclusive mix produced by G-Pek with Cuts by DJ Raw B. Side A is the mix side; a sample-heavy affair in which there are recognizable clips of Star Wars, Boogie Down Productions, and It’s Always Sunny in Philadelphia among others. It’s primitive old-school hip-hop, with dual trade-off vocals and simplistic beats; very much a throwback disposition to the days of early Run DMC and Beastie Boys, or like, Super Lover Cee & Casanova Rud. Quality production that is clean and loud. There’s a song about drinking forties, with a screwed hook from DJ Quik’s “Tonite” that goes "Put My Forty in the Freezer" over a Dr. Dre-like buzz. So there’s really no way I could not love this. Side B is the live performance side. It’s a recording from San Francisco in 2011. Despite it being RFMI’s first gig, they performed as a well-oiled machine; no doubt a testament to their respective years rocking mics. It’s hard to gauge the level of audience reaction, if any, due to the recording. Old school beats, record scratching, and two skilled emcees spittin’ on the mic. Rap music is so goddamn good when it’s done right.